The resource management system mechanism helps coordinate IT resources in response to management actions performed by both cloud consumers and cloud providers (Figure 1). Core to this system is the virtual infrastructure manager (VIM) that coordinates the server hardware so that virtual server instances can be created from the most expedient underlying physical server. A VIM is a commercial product that can be used to manage a range of virtual IT resources across multiple physical servers. For example, a VIM can create and manage multiple instances of a hypervisor across different physical servers or allocate a virtual server on one physical server to another (or to a resource pool). Resource management system functions can be accessed by cloud resource administrators employed by the cloud provider or cloud consumer. Those working on behalf of a cloud provider will often be able to directly access the resource management system’s native console. Resource management systems typically expose APIs that allow cloud providers to build remote administration system portals that can be customized to selectively offer resource management controls to external cloud resource administrators acting on behalf of cloud consumer organizations via usage and administration portals. Figure 1 – The cloud consumer’s cloud resource administrator accesses a usage and administration portal externally to administer a leased IT resource (1). 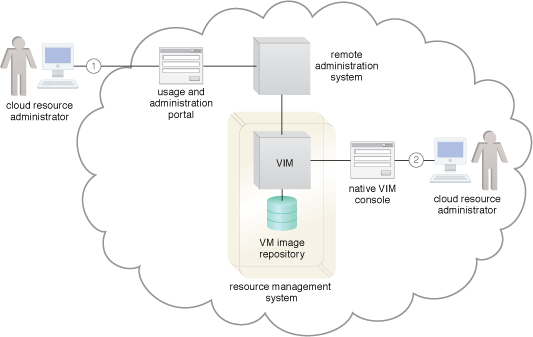 The cloud provider’s cloud resource administrator uses the native user-interface provided by the VIM to perform internal resource management tasks (2).